“Le Vallauris Restaurant”, on a quiet street off the main drag in Palm Springs, has been a favorite of the glitterati for many years. It is iconic, timeless and consistently delicious. With French born owners M. Brugemens and M. Haddedou and a French chef Jean Paul Lair, it reminds us of the wonderful meals savored in France in each of its many regions that honored their local produce and turned out the kind of plates that you journeyed to that glorious country to enjoy over the years. 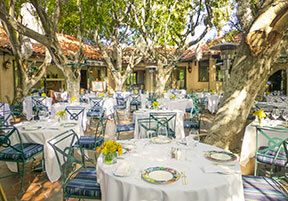 Le Vallauris, established in 1973, is located in an old historic building with charming dining room and lovely tree shaded patio reminding us of so many almost identical French terrace meals we have enjoyed over the years sitting in the dappled shade. Here the service is attentive and the courses are evenly paced. Don’t be put off by the rather drab exterior of the place because that all changes once you enter and discover the dining room and patio. Eating in the dining room, you could swear you were in a restaurant in France - anywhere. Not modern, just warm and comfortable with style. The daily specials are written on a white board propped up on a easel for all to see and brought to your table for a more intimate perusal. 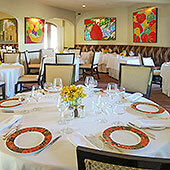 Named after the famous village in France where Picasso made his ceramics, Le Vallauris truly deserves its reputation as one of the best restaurants in California and beyond and certainly a leading light on the Palm Springs to La Quinta gastronomic Trail. In addition to serving lunch on Fridays and Saturdays, Brunch on Sundays and dinner every day starting at 5.00 PM, Chef Lair also entertains and enlightens with cooking demonstrations (click here >>) out on the patio weather permitting on the 2nd Monday of each month. And if you need a meal catered, Chef Lair and his team are happy to oblige. Jean Paul Lair was born in the Spa City of Vichy in France in 1959. He graduated from the Professional Restaurant School and then spent some years as apprentice in several hotels and restaurants in France. Jean Paul met Marlene, his better half he would say, in France, a native of the Reunion Islands. They migrated to the United States and he worked in Lake Tahoe and Los Angeles. In 1986 he joined "Le Vallauris" as Sous-Chef and was promoted to Executive Chef when "Le St. Germain" was opened and the Chef was transferred. 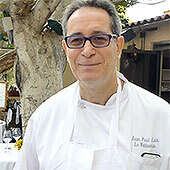 Jean Paul has led "Le Vallauris" from the traditional French cuisine of the 70's and 80's to the more modern lighter Mediterranean specialties. 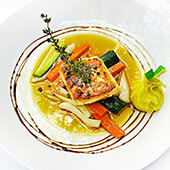 He has also recognized the expectation of the “Foodies” and he has geared his cuisine squarely in that direction. Chef Jean Paul does extensive research on the cuisine he plans to prepare and he has also incorporated the need to accommodate different demands for vegetarian, vegan and organic food. His success in doing all of this has resulted in much media attention.